Campaigning in Florida this month, GOP Presidential candidates continued to display a general lack of understanding of the state’s diversifying Latino population. While it’s well-documented that the Cuban-American population is currently a strong political force, the emerging story in Florida is that the state’s future voting population will become increasingly Latino, but less Cuban. While it’s normal for political candidates to pander to today’s registered voters, they undermine the long-term electoral prospects of their party when they fail to recognize Florida’s changing demographics. Data from the U.S. Census Bureau reveal that increasing numbers of Florida’s children are non-Cuban Latinos. Overall, Latinos make up 26% of persons under age 18. 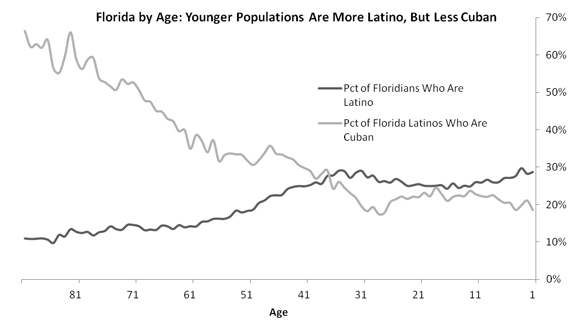 More striking, however—given Florida’s long association with Cuban immigration—is that the Cuban-origin portion of the Latino population is shrinking when you look at the youngest Floridians. While Cubans are a majority of Florida Latinos over age 70, every Latino age group below 70 is becoming increasingly non-Cuban. Cubans are more than half (54%) of Florida Latinos aged 65 and over, but they are only 22% of Latino children in the state. Simply put, the Cuban population is getting older while a younger, non-Cuban Latino population continues to grow. In fact, Cubans today are a minority of all Florida Latinos. The state’s Latino population is one of the most diverse in the nation: 29% Cuban, 20% Puerto Rican, 17% South American, 15% Mexican, 11% Central American, and 9% of other Latino origins. Candidates and the party they represent are focusing on elections in Florida, not the future electorate. In doing so they are risking the long-term success of their party. The increasingly diverse Latino community in Florida is only going to be receptive to rhetoric and immigration policies that benefit all Latinos.